BRICS* countries delegates recently witnessed what the NWU is accomplishing in the field of research and innovation when they attended an exhibition of thirteen of the university’s top of the range technologies. The technologies that were exhibited were the Green Coal initiative, Moonshine, Hanks TB, Extrusion Tchnology-CFAM, Jonker Sail Planes, MyLab, Solar Car, 3D priniting, Pertraction, TRADE software, HYSA Infrastructure with hydrogen and fuel cells, Chemical Liquefaction and Sunfarming. 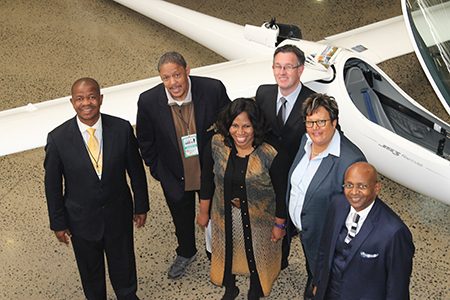 This exhibition at the NWU’s Faculty of Engineering was part of a roadshow that followed the BRICS Outreach Programme 2018 event that was held at the Madiba Banquet Hall in Potchefstroom. The event was organised by the Department of International Relations and Cooperation (DIRCO), in collaboration with JB Marks Municipality, Office of the Premier, NWDC and NWU. During the event a number of stakeholders, youths and businesses talked about their readiness for the new industrial revolution and on the issues that should be discussed at the BRICS Summit that will be held in Sandton during July. Prof Refilwe Phaswana-Mafuya, the NWU’s deputy vice-chancellor for research and innovation, explained how the NWU is dedicated to supporting BRICS. She also spoke about a recent trip to China and possible future collaboration with them. The main aim of the BRICS outreach programme in the North West province was to address the fourth industrial revolution aimed at building a better Africa and world. *BRICS is the acronym for an association of five major emerging national economies: Brazil, Russia, India, China and South Africa. Some of the BRICS delegates who attended the BRICS road show at the NWU.